We are finally on the road again after nearly a week in Winnemucca, NV. Not much there to see and do, but we did spend more time on planning our trip to Alaska. We had phone service and Internet and the price was right. We were waiting for the weather to warm up a little more. Leaving this morning we headed north into Oregon and another BLM parking spot, Antelope Valley Reservoir. A whopping 4 spaces, which in BLM parlance means 4 picnic tables, 4 firerings and pit toilets; works for us. Two 40’ motorhomes out of place there, but we didn’t care as we were the only ones there. Last night we were able to hear the coyotes howling all around the reservoir. Really makes you feel isolated. But we are on the move again so we can get phone service. John and Tillie had their house broken into for the second time and they need to be in contact with the police, neighbors and insurance people. They are real troopers and definitely have the right attitude. I would be on the first plane home. I would feel so violated. So we have arrived in Nampa, Idaho. We are now back on Mountain Time. These was a roadside sign telling us to set our clocks one hour ahead. It’s so confusing; further up in Idaho we will go back to Pacific Time. So we’re just going to stay on Pacific Time. We feel like we have reached civilization. They have malls, Walmarts’ and a Costco! The Sam’s Club went out of business!! We are only spending a couple of nights here in the parking lot before moving on. Since Sam’s is closed we found there is a Costco located across town, so we headed over there to stock up on supplies. We are bunked down in the empty parking lot of the closed Sam's Club. We planned on doing our Mother’s Day dinner this evening rather than face the crowds tomorrow. A couple stopped by in their car; they have an American Tradition, similar to John’s RV and we got to talking. They were able to give us the name of a very good local restaurant named Kahootz! But we had to go to dinner at 4 pm, because it was really 5 pm. And it’s a good thing we did, we got the last available table before they started lining up out the door. Kahootz has 43 beers ON TAP! Decisions, decisions. We all had the prime rib for dinner, it was very good. I would recommend this restaurant definitely. Bob cooked breakfast for me this morning, yum! We are moving up the road today, one step closer to Alaska. Our original plan was to drive up to Cascade and stay in a state park. We could have parked there, but basically the campground didn’t have any facilities turned on, and we were all looking forward to some water and electric hookups, so we kept on trucking up the road. This is beautiful country. We saw a sign that said we had passed the 45th parallel, which said we were half way between the equator and the North Pole. The landscape around here reminds me of early March at home. The forsythia is blooming, tulips are out, daffodils and crocus. The grass is green, but most trees still have not started to green up, depending on the elevation, at any given time on the road. And then we passed through the town of McColl, where the snow is still piled up by the houses about 5 feet, and the lake was still frozen! We knew we still had to move on; we weren't going to stay here. We were following Rte 55, which goes along the North Fork of the Payette River and the Lower Salmon River. These rivers were rushing with white water rapids for 40 miles at the very least. (We found out later, most of the rivers are still closed to kayaking and rafting as they are still to dangerous to ride.) I'm sure they were also very cold from the snow melt. This highway is the gateway to Hell's Canyon National Rec Area and the Snake River, which is just over the mountains to the west. The Payette and Lower Salmon Rivers were also the route that Lewis and Clark used on their journey to the Pacific Ocean. It is also within the land of the Nez Perce Indian Reservation. The Nez Perce National Historic Park has 38 different sites across Oregon, Idaho, and Montana giving the history of the Nez Perce Indians. What a rugged land they lived in. We finally stopped for the night in Grangeville, Idaho, a town of about 2000 residents. We have full hook-ups here at Sundowner RV Park (a gravel parking lot) and I immediately started doing laundry while preparing dinner. We were going to grill steaks outside, but it was cold and rainy, so I cooked mine on the grill over the stove burner. Pretty darn good if I say so myself. We have cell phone service at least. Happy Mother's Day everyone.! Leaving Grangeville, ID, we took scenic Route 13. We finally had a clear sky traveling day for the first time in a while. This time we followed the Clearwater River. Came across a nice Rest Area where we stopped to have lunch instread of eating on the road. Too bad we were traveling; Tillie and I hated to get back into our coaches the weather was so nice. We stopped for the night in the town of Bovill. John had read where there was a bar in this town that had free parking for campers. They used to have full hookups and had to take them out, because people kept blowing fuses at his place. We ended up parking beside the bar in what is now his backyard with some of the prettiest grass. Looks like Oregon Rye. In exchange for free parking we went in and patronized his bar (we found out it was HER bar). Bill and Cheryl Hartman. The bar belongs to Cheryl, Bill runs it. She is the assistant postmaster for the local post office. The official head postmaster left 18 months ago, but they haven't filled the position. It's a case of getting a lower paid worker to do the work of the boss without being paid for doing someone else's job. He also rebuilds motorcycles, and that Bill and John have a mutual good friend in common. That was enough to start a party. After a while I was in no mood to cook so we all ate the Day's Special, Tacos! While on the subject of food, they ended up going mushroom picking up in a meadow. I went home and took a nap. When they got back Tillie cleaned the mushrooms and cooked them up with onions. All in all a pretty good place to spend the night. We left fairly early this next morning. By our standards anyway. We headed back to Rte 95, stopping along the was at the Coeur D'Alene Casino and Resort to play a couple of one armed bandits for a while. Before continuing on, we stopped at the Reservation gas station where we were able to buy diesel for $3.97. We haven't seen those prices in quite some time. I have to write all this stuff down, so Sandy and I will remember all we've seen and done on this trip. There is so much happening, sometimes we can't even remember what days we have spent in what town. ...That being said, we are headed on to Post Falls, Idaho, where we spent the night in another Walmart. It is located outside of Coeur D'Alene, ID. We had to stop to pick up a part from an appliance store to repair our microwave. It has been usable but only for a short time. Hopefully this part will allow me to bake for longer periods. While Sandy was in the appliance shop, there just happened to be a craft store next door advertising fabric, gifts and crafts! Lucky me! It was basically a quilt shop with some gifts items for quilters! They apologized because they didn't have much fabric to select from. Their boss had taken most of the fabric to a quilt show over in Spokane, Washington, but I managed to find some; imagine that! Woke up this morning to continue our northward trek about 80 miles to the town of Sandpoint, ID. This is our last mail stop before we cross the border into Canada, which we picked up on our way into town before proceeding to a Walmart. Our plans were to overnight there before proceeding to a Corps of Engineers park and campground which doesn't open until tomorrow. After parking, Tillie went on to Curves, and the rest of us drove out to the campground to check it out. It's a beautiful campground located on Lake Pend Oreille, (pronounced Ponderay). It's the deepest lake in Idaho at over 1100 ft. Absolutely beautiful. So is Sandpoint, which has a thriving downtown. Very sophisticated and upwardly chic! We also found there is a campgound located on the county fairgrounds much closer into town for only $2 more a night. Not quite the view, but definitely a gas saver for all the running around we will do while staying here. We will be staying here for 9 or 10 days waiting for the weather to warm up before heading across to Canada. This is it, last stop, get'er done now, whatever it is that needs doing. A couple RVing in another park, suggested we check out the Pend Oreille Winery located downtown. That's where they were headed. So after dinner we all rode downtown. What we discovered was it was a winery, yes, but they don't grow any grapes themselves. It was basically a boutique winery. Did I mentioned I broke my small hand mirror in the bathroom today? Does that double my bad luck? Am I superstitious? NOT! Moved to the county campground even before we had breakfast. There had been a strange man sitting outside of John and Tillie's RV last night. He was sitting there drinking. It was weird. It was cold, windy and rainy last night. He slept the night at the base of their steps and when John started he generator in the morning, he got up, went over to another camper parked there, opened the door and went inside. Go figure. Over at the fairgrounds, there was a horse training show going on. It was classes for leaders and parents of 4-H kids who are working with horses. The day was sunny and windy. You could hear the horses whinnying. Then a woman named Julie came over to the campground pavilion and started cooking with cast iron pots. That was something we all had to investigate. She was cooking dinner for all the horse people using about 8 or 9 cast iron pots using the stacking method. Very interesting. It was fun talking to her. We also ended up eating dinner with her. BBQ chicken, baked beans, Marcy's cheesy potatoes, corn, broccoli salad, garlic bread and peach cobbler and watermelon. Wonderful meal. Actually it was a quiet day here at camp. The day started out sunny and windy and by dinner time, it was windy and rainy. We have been expecting this rain for two days. So has all of northern Idaho. They even drained the lakes around here. With the weather warming up so quickly and with all the rain they have had lately, the snow pack is melting too fast and they expect a lot of flooding. Thankfully we are not located near any streams or rivers. For tonight's birthday dinner, we took Tillie to Trinity at Sandpoint, affectionately known as TSP. Tillie and I had stuffed halibut, with different sauces, Sandy had the same and John got calamari. Very nice restaurant located lakeside in the downtown area. Our waitress and the service were wonderful. Side bar: One of the nicest things about this trip is we have been able to celebrate all our birthdays and wedding anniversaries. It's nice to have friends around to celebrate with you. Got mail today. The guys registered for the 5K run (or walk) this weekend. There are trains running by the back of the campground, they come through with regularity. The whistle on the trains bothers Tillie, but Bob and I enjoy the sound. We were able to sit out enjoy the fresh air for a change. 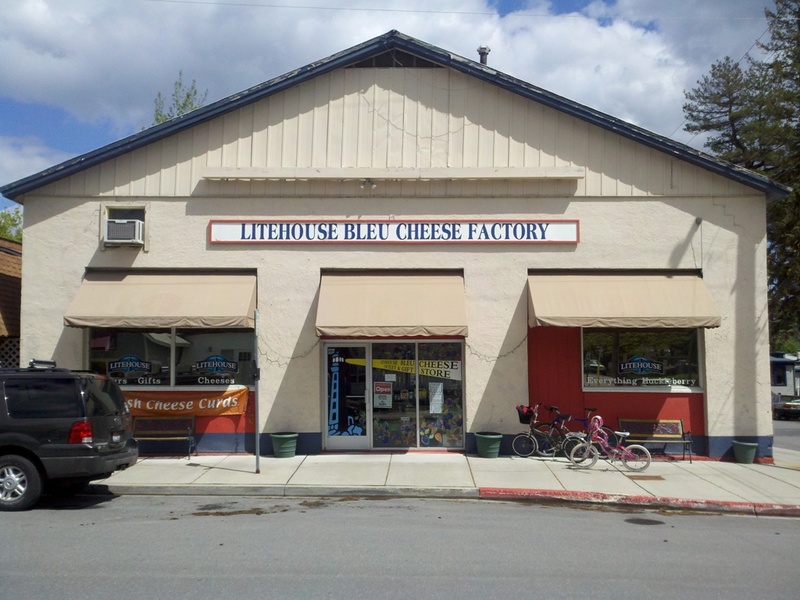 Weather is starting to get nice Went into town to visit the Litehouse Blue Cheese Factory and MickDuffs Brewery for a sample of their microbrews. On the way back we stopped at a market called Yoke's, and bought some Tillamook ice cream. They had so many wonderful flavors, we ended up with Tillamook Mudslide. Try names like Grandma's Apple Pie, Huckleberry Heaven, Chocolate Peanut Butter Cookies, and the list goes on. Wonderful, wonderful. Bob had an appointment to get the RV serviced. Appt was for 8 am. When we got there found out the parts hadn't arrived yet, so we went back home. Will have to do it again tomorrow :( Went to Urgent Care for Carol. Had urine infection, rash on arm, and itch skin. Found it was my hidradenitis, and 2 bone spurs on my left foot that are killing me, along with major arthritis. So I am hopped up on antibiotics for a couple of days. Bob and John hiked up the mountain located directly behind us. They figured they gained about 1000 ft in elevation on their 3 1/2 mile hike. Got transmission fluid changed. I stayed at the campground in the car until John and Tillie woke up. We didn't want to lose our space to early arrivals for the 50' bash weekend. Motorhomes, trailers and 5th wheels have started arriving at the campground, later in the afternoon, which we have previously had all to ourselves. They are all participants in "Lost in the 50's Bash being held this weekend in Sandpoint. This is their biggest event of the year and it is a VERY BIG DEAL. These people are bringing in restored cars that are absolutely fabulous! One man pulled in with a 45' King Aire by Newmar, pulling a 3 axle trailer with a matching paint job as his RV In the trailer was a multilift with 2 cars inside. One was a 56' Chevy that he paid $100,000 for. (The longer we were here, the more we found out that's a average price for some of these cars. Drove up the mountain to Schweitzer Mountain Ski Resort. There is still a ton of snow up there. Back home we would still be skiing on this 5-6 ft of snow. The view from the top up here is awesome. It overlooks Lake Pend Orielle, the largest lake in Idaho and also the deepest at over 1100 feet. Bob and John went downtown to look at the car show They came back with lots of pictures. They had a good time without the women tagging along. Cooked spaghetti dinner in honor of Bob's birthday with John and Tillie joining us. Tillie made Bob oatmeal cookies for his birthday, saying they were off limits to me! Today was our last day here before heading into Canada. First thing in the morning Bob and John participated in their first 5K race. Walkers were welcome. They were the last to start...and the last to finish, on purpose. Tillie and I are very proud of them. It was supposed to rain the whole weekend, but it held off for all the major events. There were lots of last minute things to do, grocery shopping and such. Beautiful ride up to Kootenay National Park and Radium Hot Springs. I thought we were going to stop and jump in, but instead d rove on to MacLeod Meadows campground where we camped on the bank of the Kootenay River. The Canadian Rockies are Awesome. Tonight is the final show for "Dancing With The Stars". Bob promised me we would get it on the satellite. He had to work a lot but he got the job done. Bravo, Bob! ! He had to move the rig four times to get a spot for the satellite. Cracked the fiberglass on the front of the rig trying to get past a tree stump. He was not a happy camper about that. Do you know what time the sun comes up, this far north?? VERY EARLY. There was cloud cover, but it was daylight at 4:30 am. That's what happens when you get up to use the bathroom in the middle of the night. We rode up the Icefields Parkway. Absolutely "Awesome". I now know why that word was invented. It is so overused, but not in this case. We saw a lot of deer on the side of the road late this morning, guess they don't have to worry about getting shot in the park. We stopped at Lake Louise around noon. The sun was out, but the air was chilly. I was able to walk up to Lake Louise; the lake is still frozen and it's almost June! There is snow laying all over the ground, but it is crusted over with dirt as it has been swept off the walkways and such. We then continued on up the parkway until we came to the Columbia Icefield and pulled into the parking lot for the night. We are across the street from the glacier. You can either walk up to it or you can buy tickets to go up and ride out onto the Athabasca Glacier. Tonight is the finals for Dancing with the Stars. The clouds and storm came in and the TV broke up a lot. Not sure we are going to get the results. Bob had to record the East and West coast feeds. Will wait until morning to get the results, I'm tired. Good night! What a day! We are waking up earlier and earlier as the sun keeps rising earlier. I'm talking 6 AM folks. That is not me. We also thought we might wake up to the white stuff laying on the ground because of the cold temps and rain, but we were okay. Dry roads! First Bob and John walked over to the glacier. I would have gone but this heel spur keeps me from doing much, bummer. There are only certain areas that you can walk on, or else you could fall into a crevase and not been seen again for 100 years after the glacier recedes. The "toe" of the glacier is at 6500 ft. After they got back, we took to the road again. We had not gone very far before we saw cars ahead. An animal jam; A GRIZZLEY BEAR! It was just munching and foraging just off the left side of the road. I was able to get out and get pictures not 30 ft from where he was standing. Back on the road we were excited now! Wildlife! Further down the road, more cars. A BLACK BEAR on the right side of the road. I did not have to get out to get good pictures. Amazing! These guys look at you and yawn; what are you people looking at?, and go back to eating. When we pulled away, the sound of the diesel engine scared it and took off for the woods. At least I got some good pictures. Down the road a little ways we saw a couple of female elk on the left side. A little while later I saw a bird I thought had caught a fish, then I realized it was a bald eagle! I got a picture of it flying but you can't tell it's an eagle from the picture. We stopped and ate lunch in Jasper in our coaches. It's a quaint little town located within Jasper National Park. As we left, on the outskirts of town, Tillie saw a coyote but we missed it. But we were rewarded later on when we came upon a male elk with his antlers already growing with the fuzz still on them. Then we came across...we're not sure what they were. Either they are mountain goats shedding their winter coats or they were Rocky Mountain Sheep. We have got to get a book and find out. What a day! So much wildlife in one day! The only thing we have not seen yet is a moose! Good things come to those who wait. I can wait a little while longer. I surely can't complain. In the last three days we have been though three Canadian National Parks; Kootenay, Banff and Jasper National Parks. We traveled thru Banff in 1991, but in a different direction and it was during July. The weather was a lot nicer then. So much has changed since then. We are stopped here in Hinton for the night, in a Walmart parking lot. Canada really likes their parks and they like for you to pay $$$ even if they don't offer any facilities. Our destination for tomorrow is either Grande Prairie, AB or Dawson Creek, BC. We'll see how we do tomorrow. Weather today was cold and overcast all day, with rain in the evening. It was light until after 9:30 pm. Bob grilled pork chops on the grill last night with the last of his Carolina Treet. He is so happy to have a new supply of his favorite barbecue sauce! Thanks Mom and Dad! We received word today, that Uncle Robert Passed away this morning. We are so very sorry to hear that he is gone. It was not a good day. Spent the night in a Walmart parking lot. We had Internet service because we were parked so close to the Days Inn across the street. We both managed to get a few notes out to people. First thing we did was move out to Northern Lights RV Park, set up, and started a load of dirty laundry before we headed out for sight seeing. We stopped at the Mile "0" sign to get our picture. It's the touristy thing to do. We also stopped to see a movie on the making of the Alaska Highway at the Visitors Center, it was well done and very interesting. The Alaska Highway was originally 1528 miles long, but it is shorter today (about 1450 some miles) because they have straightened the road in places when making repairs to the road. The U.S.A. paid for the materials and supplied the men to build it, and Canada gave the land for it with the provision that the road be turned back over to the Canadian Government six months after the war ended. It was built in a record breaking eight months and 12 days. Bob cleaned our windshield on the RV and discovered a chip in the top of the driver's side of the window. Talked with the insurance people and hopefully can get it taken care of tomorrow morning before leaving town. And this is only mile "0". Hope this is not the sign of things to come. Bob and I went back into town and got the windshield fixed first thing this morning. No problems there, thank goodness. So we started on our first leg of the Alaska Highway. It's a beautiful day. Sunny and warm....the first time in a long time we have seen a day like this. About 20 miles up the road we took our first detour to cross Kiskatinow Wooden Bridge, and it's curved no less. Amazing! It is still in great shape. A beautiful day, but didn't see much in the way of wildlife, go figure. Our stop for the night was in Fort Nelson. We were able to just park along the side street of the main street running through town. It was like a park setting. We had a row of trees with Christmas lights still strung on them, there was a picnic table and trash can also. Another couple stopped behind us, Bill and Margie Hicks from Ramona, CA, but they moved on to the IGA store. They were afraid we would be asked to move on during the middle of the night or be given a ticket for illegal parking. C'est la vie! Right across the street was a Dominos Pizza place. Guess what we had for dinner? The hardest part of this trip is still....trying to get used to going to bed while it is still light outside. I feel like a three year old. Ran into Bill and Margie again at a rest stop. Not too far after we left the rest stop, Bill got on the horn and said he had lost all air line pressure. We all pulled off to see if we could help diagnose the problem. His air pressure was okay but the gauge and alarm were giving false indications. This is scary when that is what operates your brakes. We put him in the rocking chair as we moved on down the road to Laird Hot Springs Provincial Park Campground, and he had no more problems. The sky looked kind of ominous, but we all quick jumped into our swim suits and headed for the hot springs. They were heavenly! There were two pools, Alpha and Beta, with Alpha being the hotter pool. The further away from the one end we got, the cooler it got. Twenty minutes was about all we could take. Headed back to the RV's for dinner. We saw more wildlife today, including a Moose cow but the picture is not good, so you'll just have to take my word for it. Bob took the lead and John covered the rear today. Drove just about 150 miles up to Watson Lake to see the Sign Post Forest. Bob and John finished making our sign last night. After eating lunch, we took off for a tour of the signs. Bob had to get down his ladder to get our sign put high up on one of the poles. We did see one other sign from Wilmington, NC, painted Carolina Blue, no less. We are spending the night here also at another provincial park next to a lake. After dinner we went to see the show at the Northern Lights Centre on the Aurora Borealis. Well, half the show was on that, the other half was on Astronauts and the Space Shuttles, which I thought was very interesting, but the others felt they had been duped and there wasn't much info on the Northern lights. Across the lake there was a huge plane that was taking off and landing. We had no idea what it was for. We thought maybe it was a supply plane or loaded with tourists. I am having to put the names of places along with the dates because we are traveling so fast now I can't remember what we did where. It's all becoming a jumble. Thank goodness I am keeping this blog. My memory is not as good as it used to be. We gave the lead to Bill today; each man taking a turn at leading our caravan. We said our goodbyes to Bill and Margie late this afternoon, who are continuing into Whitehorse today. We turned off to meet our friends, Brenda and Laverne, who live in Whitehorse and winter in Quartzsite, AZ. We parked in front of their house after assuring us their neighbors won't mind. They didn't know exactly when we were going to show up. We just stopped and blasted our air horns. HONK! HONK! They live on Marsh Lake about 20 miles south of Whitehorse. It's beautiful out here.